Skin cancer is the most prevalent of all types of cancers. It is estimated that one million Americans develop skin cancer every year. Fair-skinned people who sunburn easily are at particularly high risk for developing skin cancer. Other less important factors include repeated medical and industrial x-ray exposure, scarring from diseases or burns, occupational exposure to compounds such as coal tar and arsenic, and family history. Actinic Keratoses or solar keratoses are considered the earliest stage in the development of skin cancer. They are small scaly spots most commonly found on the face, ears, neck, lower arms, and back of the hands in fair-skinned individuals who have had significant sun exposure. 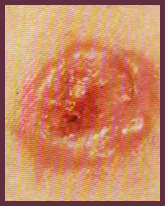 Actinic Keratoses can be treated by cryotherapy (freezing), topical chemotherapy (applying a cream or lotion), chemical peeling, dermabrasion, laser surgery, curettage, photodynamic therapy (a chemical is applied to the skin prior to exposure to a light source), or some other dermatologic surgical procedures. Some Actinic Keratoses may progress to advanced stages which require more extensive treatment. Proper use of sunscreens can help prevent Actinic Keratoses even after extensive sun damage has already occurred. Basal cell carcinoma is the most common type of skin cancer and appears frequently on the head, neck, and hands as a small, fleshy bump, nodule, or red patch. Other parts of the body may be affected as well. Basal cell carcinomas are frequently found in fair-skinned people and rarely occur in dark skin. They do not spread quickly. It can take months or years for on to grow to a diameter of one-half inch. 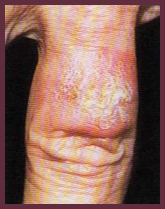 Untreated, the cancer often will begin to bleed, crust over, heal, and repeat the cycle. Although this type of cancer rarely metastasizes (spreads to other parts of the body), it can extend below the skin to the bones and nerves, causing considerable local damage. Squamous cell carcinoma is the second most common skin cancer; it is primarily found in fair-skinned people and rarely in dark-skinned individuals. Typically located on the rim of the ear, the face, lips, and mouth, this cancer may appear as a bump, or as a red, scaly patch. SCC can develop into large masses and become invasive. Unlike basal cell carcinoma, this form of cancer can metastasize (spread to other parts of the body); therefore, it is important to get early treatment. When found early and treated properly, the cure rate for both basal cell and squamous cell carcinoma is more than 95 percent. Malignant melanoma is the most deadly of all skin cancers. Every year, an estimated 7,700 Americans will die from melanoma; it is projected that more than 46,000 Americans will develop melanoma annually. The death rate is declining because melanoma is usually curable when detected in its early stages and patients are seeking help sooner. Melanoma begins in melanocytes, the skin cells that produce the dark protective pigment called melanin which makes the skin tan. Since melanoma cells usually continue to produce melanin, the cancer appears in mixed shades of tan, brown, and black although it can also be red or white. Melanoma can metastasize (spread), making treatment essential. Excessive sun exposure, especially sunburn, is the most important preventable cause of melanoma. Light-skinned individuals are at particular risk. Heredity also plays a part. A person has an increased chance of developing melanoma if a relative or close family member has had melanoma. Atypical moles (dysplastic nevi), which may run in families, and a large number of moles, can serve as markers for people at increased risk for developing melanoma. Dark skin is not guarantee against melanoma. People with skin of color can develop melanoma, especially on the palms, soles, under the nails, in the mouth, or on the genitalia. If a skin biopsy reveals cancer, the dermatologist has an array of medical and surgical procedures as treatment, depending upon the type of cancer, its location, and the needs of the individual. Dermatological surgical treatments include surgical excision, electrodessication and curettage (ED&C) which involves alternately scraping or burning the tumor in combination with low levels of electricity, cryosurgery (freezing using liquid nitrogen), and laser surgery. Mohs micrographic surgery is a special procedure used to remove the whole tumor while sparing as much normal skin as possible. Other dermatologic treatments include radiation therapy and photodynamic therapy (a chemical is applied to the skin prior to exposure to a light source). Topical chemotherapy products also may be used. Develop a regular routine to inspect your body for any skin changes. If a growth, mole, sore or skin discoloration appears suddenly, or begins to change, see a dermatologist. It is wise to have an annual skin examination by a dermatologist, especially for adults with significant past sun exposure or a family history of skin cancer. Overexposure to ultraviolet light (sunlight or tanning lamps), especially if it results in sunburn and blistering, is the main cause of skin cancer. Since the sun’s ultraviolet rays are the main culprit, the most effective preventive method is sun avoidance. Seek shade when appropriate, remembering that the ultraviolet rays are the most intense between 10:00 a.m. to 4:00 p.m. Begin early use of sun protection in childhood. Children under six months of age should not have prolonged sun exposure, but if it is impossible to avoid the sun, use a sunscreen. The use of sunscreen should always be part of a program for sun avoidance and never as an excuse for increasing sun exposure. Early detection and removal offer the best chance for a cure. Periodic self-examinations aid in recognition of any new or developing lesion. Get familiar with your skin and your own pattern of moles, freckles and beauty marks. Make sure to look at the entire body every month or two. 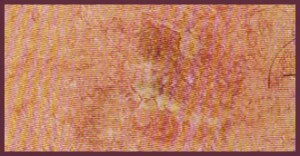 Watch for changes in the number, size, shape, and color of pigmented areas. Consult a dermatologist promptly if any changes are noticed. Individuals at high risk should be examined by a dermatologist on a regular basis.